Cokie Roberts' Role At NPR, Explained : NPR Public Editor She's a commentator, not a correspondent. 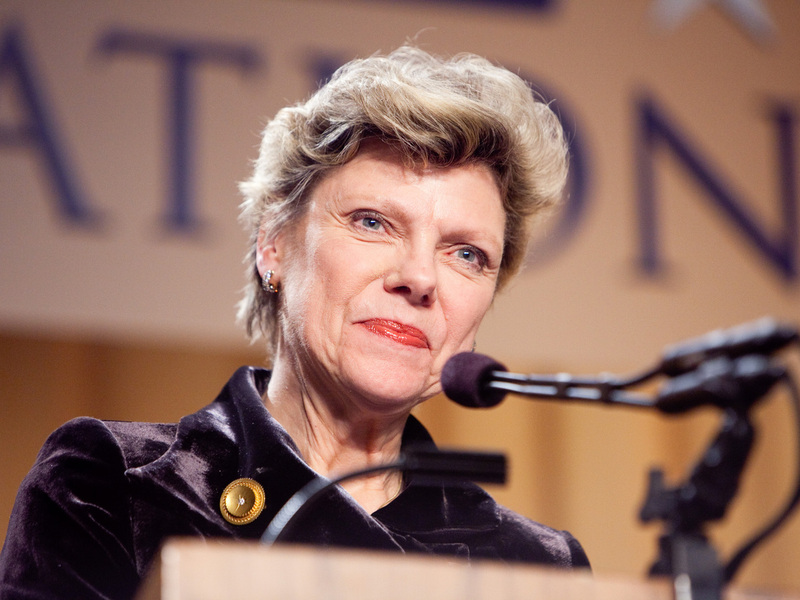 Cokie Roberts appears at the National Press Foundation's 26th annual awards dinner in 2009. Morning Edition listeners heard an awkward exchange this morning between regular Monday commentator Cokie Roberts and David Greene, one of the hosts. As part of Roberts' usual commentary, the two discussed Roberts' role at NPR. The short version of that part of the conversation? She is a commentator, not a reporter or a senior news analyst under contract (her previous title). She has not been a full-time staff member at NPR since 1992. Why does that matter? Because NPR commentators and reporters live by different rules. As Michael Oreskes, NPR's senior vice president of news and editorial director, wrote in a staff memo this morning: "Our journalists have clear instructions. We do not support or oppose candidates. We don't advise political parties. We gather the news and seek as many points of view as we can. Cokie's role has evolved into being one of those points of view." As NPR's media correspondent David Folkenflik reported in a separate article, the issue of Roberts' role arose because of opinions expressed in a syndicated column written with her husband, journalist Steven Roberts. The two wrote in late February: "But there is a deeper reason, beyond partisanship, to stop Trump: He is one of the least qualified candidates ever to make a serious run for the presidency. If he is nominated by a major party — let alone elected — the reputation of the United States would suffer a devastating blow around the world." Whether journalists should be neutral in the face of a candidate such as Trump is a separate issue; there are those who argue that not speaking out is "an abdication of the journalistic duty." What is clear is that many NPR listeners did not know that Roberts was a commentator and that in many people's minds she remained a correspondent or news analyst subject to NPR's ethics code. As Joe Frankenfield of Mt. Pleasant, Mich., wrote to my office: "As [a] listener for many decades I just think of her as 'one of the family,' which is ambiguous." That is largely NPR's own fault. She is rarely identified as a commentator on-air on Monday mornings, except coming out of interviews. Moreover, she is often paired with Mara Liasson, who is a correspondent (I previously raised that issue in the newsroom because I believe that pairing raised questions about Liasson's role, about which many listeners already express concerns, due to her work as a Fox News contributor). And Roberts' previous title — "senior news analyst" — persists; she was identified that way on MSNBC last week when she addressed some tough questions to Trump. She is also identified by that title in promotional materials for an upcoming talk at a local public radio station. No wonder listeners are confused. Oreskes asked for the on-air clarification this morning; in his memo he said that NPR "should have done a better job of making clear that her role was as a commentator and that in other venues she was expressing personal opinions as other commentators do." I think the on-air conversation was more confusing than clarifying but given the mail I have received in recent weeks (although none about the Roberts' opinions expressed in the syndicated column) I think it was helpful to in some way make clear Roberts' role. I asked Oreskes whether Roberts would continue to be paired with Liasson or other NPR journalists, which I think is a bad idea if NPR really wants to make a distinction between the roles. Alternatively, some listeners have written to me this morning asking whether she will now be paired with a commentator with an alternative viewpoint, as David Brooks and E.J. Dionne or their substitutes are on Fridays on All Things Considered, and as she was last week, when she was paired with Ben Domenech, founder of the conservative website The Federalist. (Roberts told Folkenflik that she is "a totally unpartisan human being," so that pairing in itself raises questions). Listener Patrick McGraw of Beachwood, Ohio, suggested Roberts should go on hiatus or leave altogether, writing that, "A policy — without resorting to self-serving after-the-fact hair-splitting distinctions about an individual's technical relationship to the network—that NPR people refrain from publicly endorsing or supporting specific named candidates is entirely appropriate and should be enforced." "We aren't going to rush. The first step is to listen to the kinds of questions and comments we are getting from listeners. We also want to talk this through thoughtfully with colleagues, station leaders, and, of course, Cokie. As Cokie said so well this morning, we are living through an extraordinary time. The old templates don't match the world very well. It isn't about just left and right or Republican and Democrat. There is inside and outside now. Establishment and anti-establishment. Those who feel estranged. We have to find the voices and the presentations that best serve this complicated story. Traditional pairings may or may not be adequate to the complexity of this political world. I did like last week's program. But we don't have any decisions and may never have just one model. We will follow two principles. We will clearly label commentators and we will maintain visible lines between NPR staff journalists and those commentators. Folks like Mara, Domenico [Montanaro, NPR's lead political editor] and Ron [Elving, NPR's senior Washington editor] do an excellent job reporting and explaining politics. They don't express their personal opinions. We get their best judgments based on reporting and years of experience. Our commentators, as Cokie said, have a different role. We have to make it simple for listeners to differentiate between them." NPR's standards editor, Mark Memmott, had more to say on the differentiation NPR makes between analysis and commentary in a note sent to the newsroom today. One other note: Some listeners took today's "clarification" to mean that NPR was chastising Roberts or censoring her for expressing an opinion they felt warranted. I take it the opposite way. As a commentator, Roberts is free to say whatever she wants. I've found that her commentary on NPR is fairly muted; in the interview with Folkenflik, she said there was little difference in how she approached the job as senior news analyst versus commentator. Perhaps now she will express opinions more forcefully.